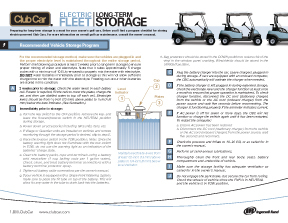 Preparing for long-term storage is a must for your course's golf cars. Below you'll find a program checklist for storing Club Cars. For more information on overall golf car maintenance, consult the owner's manual. Store cars a minimum of six inches away from any wall and with 12 inches between cars. Install wheel bumpers on floors to reduce the possibility of damage to cars and building walls. Aisles should be a minimum of ten feet wide for easy entry and exit and for passing. Aisles may be slightly less, but this will increase the risk of damage to cars. Car spaces should be a minimum of five feet wide and eight feet long. Smaller spaces will increase the risk of damage to cars. Number all chargers and parking spaces so cars can be returned to the correct spaces. This will enable proper fleet rotation. In a 120-volt, 60 Hz application, each charger should have its own dedicated 15 or 20 ampere separately protected (circuit breaker or fuse) single phase (#12 Cu) branch circuit. These circuits will be supported by their own neutral that runs back to the circuit panel. If you find it necessary to utilize both sides of the duplex receptacle, you must maintain an individual circuit for each charger (2 circuit breakers for one duplex receptacle) and the neutral must be oversized (#10 Cu). If Club Car chargers are not used, a consultation with the charger manufacturer for electrical specifications is required. All electrical wiring must be installed in accordance with the electrical codes for your area. Install surge arrestors on incoming AC power lines to help protect electrical/electronic components in the charger and on the car from all but direct and very close lightning strikes. Shelf-mounted chargers should be approximately five feet off the floor and aisle (roof-suspended) chargers should be no less than six feet off the floor. Shelves should be a minimum of 12 inches deep and 14 inches wide for each charger, and capable of supporting approximately 35 pounds or more. DO NOT hang charger upside down, and ensure the charger ventilation slots are unobstructed and proper ventilation is available. In a 120-volt, 60Hz application, the peak current draw is 9.5 amps AC and peak power consumption is 1140 watts. Please contact the US Energy Management Services Department of the US General Services Administration (www.gsa.gov/energyservices) for information concerning other applications. In a 120-volt, 60Hz application, the peak current draw is 9.0 amps AC and peak power consumption is 1080 watts. Please contact the US Energy Management Services Department of the US General Services Administration (www.gsa.gov/energyservices) for information concerning other applications. In a 120-volt, 60Hz application, the peak current draw is 11 amps AC and peak power consumption is 1320 watts. Please contact the US Energy Management Services Department of the US General Services Administration (www.gsa.gov/energyservices) for information concerning other applications. 2.5.1. In a 120-volt, 60Hz application, the peak current draw is 13 amps AC and peak power consumption is 1560 watts. Please contact the US Energy Management Services Department of the US General Services Administration (www.gsa.gov/energyservices) for information concerning other applications. NOTE: A licensed electrical contractor should be used to determine the incoming service to the storage facility. Calculated amp requirement may be reduced depending on the number of service conductors or multi-phase configurations to the service panel. 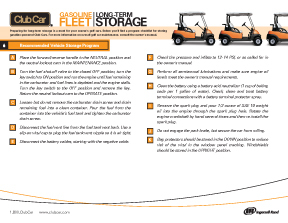 Approved containers or tanks should be utilized to store gasoline away from the golf car storage facility. Requirements vary by location, so please contact your local Fire Marshall or other appropriate authority to determine the codes applicable to your location. The fuel storage or pumping device must be grounded to avoid electrical arcing caused by the build-up of static electricity. If the storage/pumping device is not grounded, the vehicle must be grounded to the pump prior to and during dispensing fuel into the vehicle. A minimum of five air exchanges per hour in the golf car storage facility is recommended, based on historical data. The golf car storage facility ventilation system must provide adequate fresh air to prevent the hydrogen gas concentration from exceeding 2% by volume. 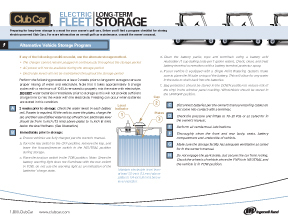 The Battery Gassing Flow Rate will determine the approximate hydrogen gas concentration level at any given period of time in an electric golf car storage facility. Battery gassing occurs during the charging cycle as hydrogen and oxygen are released from the battery as electric current is passed through the water in the battery cells. The flow rate is only at significant levels during the final portion of the charging cycle, and the length of this gassing period is dependant on the discharge level of the batteries. Thus, a deeper level of discharge leads to an increased length of battery gassing, with regards to time. The Club Car 48 volt electrical system has a charge finish rate of 4 amps, and a total of 24 cells. The published value for the amount of hydrogen/amp-hr per battery cell is 0.418 liters, which will be used to calculate the estimated gassing flow rate. The battery gassing only occurs at this rate during the final portion of the charge cycle. Thus, depending on the depth of the discharge of the batteries, this time period will vary. As mentioned above, a deeper level of discharge leads to an increased length of battery gassing, with regards to time. The total volume is not as important as the gassing flow rate, given that the flow rate is what will determine the gas concentration level at any given time. Note: This flow rate is only valid for the PowerDrive 48-volt charging system which has a constant current finish and will not change as the batteries age.